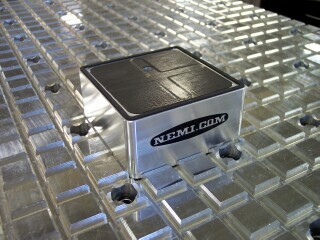 The NEMI Square One Piece Vacuum Pod. NEMI has met our customers and dealers request for a lower cost vacuum pod with the great solid holding power of aluminum. These vacuum cups are available in many different sizes to suit many applications. They are available with a variety of bases to fit most any machine including Heian, Homag, Weeke, Holzher, Thermwood, Busellato, C.R. Onsrud, Routech, Komo and many others. This vacuum cup has the same height as all our standard vacuum pods 1.771, but does not rotate and shift like our patented slider pods. These pods are also available with an optional auto vacuum valve. The One Piece Vacuum Pods come standard with the 'Super Grip' top configuration. Now you have a low cost solution, made in the USA! The NEMI vacuum pod or table spikes help add extra holding power to your vacuum setup. These locator pins are designed to locate your parts with ease!